Buying Solitaire jewellery is about a whole experience than the product itself and papilior believes in just that, with breathtaking solitaire diamond bracelet designs you are one step closer here in owning an exquisite statement piece. The diamond solitaire bangle bracelet brings style to any ensemble effortlessly, while solitaire bracelet may have caught on the trend because of over the top celebrity buys but surely is one here to stay. The solitaire bracelet designs here are ranged at a very affordable price starting INR 25,000 only and going up to INR 75,000, the prices vary according to your choice of cut, clarity and color in diamonds. 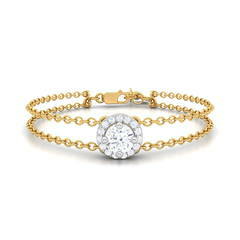 Recommended solitaire bracelets diamond would be the Raizel Solitaire Bracelet – the finesse of this piece lies within the princess cut solitaire that will make heads turn wherever you go & the Chloe bracelet solitaire is designed for women who simply cannot get enough of diamonds. Rest assure all purchases at papilior are IGI certified for diamonds and BIS hallmarked for gold, with best offers and discounts you can sit back, relax and shop while you work or play.